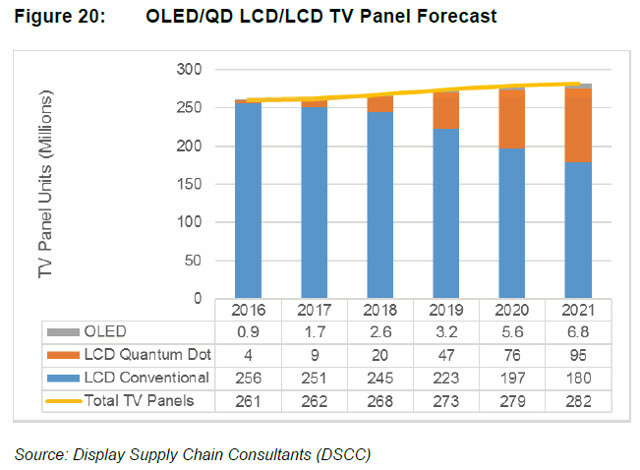 A new white paper from Display Supply Chain Consultants (DSCC) provides an analysis of quantum dot (QD) TVs vs. OLED TVs. It discusses the technology trends of the two but adds some unique perspective on the manufacturing capabilities of the two technologies – which can indeed be a determining factor in establishing a leadership position. The paper also provides a forecast and can be downloaded for free HERE. 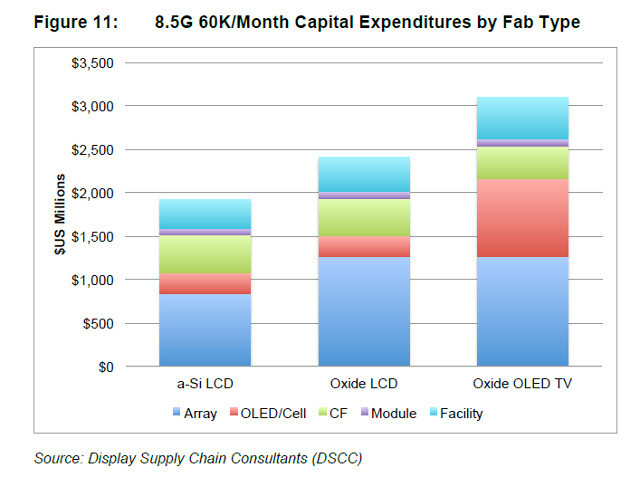 In the supply chain analysis that DCSS performed, they looked only at 55” and larger fab capacity for OLEDs and LCDs. In their analysis, they find that LCD manufacturers will primarily use a-Si instead of ZnO for the backplanes of these advanced UHD TV (93% share of 55”+ panels in 2021). Why? Because a-Si can achieve 4K resolution at 120 Hz at a lower cost, albeit with higher power consumption compared to ZnO. Perhaps the most important driver is capacity for OLEDs. While this will rise an impressive 64% CAGR to 2021, it will still represent only 6% of this large panel manufacturing capacity. Most of the new OLED capacity is being targeted toward mobile devices, the report finds. 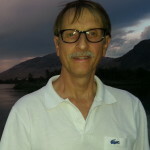 There is additional cost for the QD solution and the paper focused primarily on the cost of the QDEF film from 3M. As Figure 14 show, costs for a 55” class sheet of the material will fall from $77 today to just $8 in 2021. 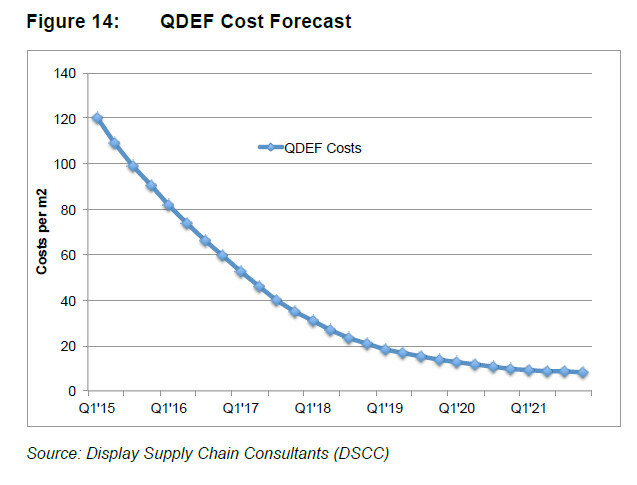 That means the additional backlight cost to make it QDEF-enabled will only be $10 by late 2020. The report discusses some of the other implementations of quantum dots such as their use in color filters as well as electrically driven quantum dots, but these do not seem to play a big role in their 5-year forecast, which is shown above. Clearly, this group does not see a big change in the percentage of OLED TVs going forward, but a big change in QD-enabled TVs.